The stormy seas and gale force winds around Tasmania provide a challenge for any boat. What, then, possessed 3 young women to try to seakayak around the 850 mile Australian island? In this warts-and-all documentary, award winning adventure filmmaker Justine Curgenven gives a real insight into the highs and lows of a challenging expedition. You feel like you are there in the kayak as the girls battle through 3-storey high swells on the exposed SouthWest coast and heave their 100kilo kayaks over drying-out sandbanks. They resort to 4am starts to try to beat the constant headwinds but still they endure the heartache of turning back against a gale force storm. This film won 'Best sea kayaking film" at the Reel Paddling Film Festival, 'Best Film on Adventurous Sports and Lifestyles' at the Wanaka Mountain Film Festival and 2nd place at the biggest European kayaking Film Festival. 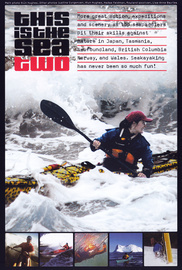 It was a finalist at Kendal Mountain Film Festival & the National Paddling Film Festival int the USA. It won an honourable mention at the "Llanberis Mountain Film Festival" and the Neuse Riverkeepers Festival in NC.